What a great idea! I will have to remember this for a mother's day present for the grandmas. These candles are incredible. I am going to mark this idea on my calendar so I can have the kids make them for mother's day gifts. Thanks for sharing. Did it and loved it! I used paint and it was fine. Thanks for the idea and great description! that is really creative....i might try that! Wow--that is such a great idea. Love it!! This is terrific! 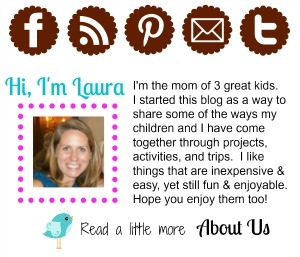 Could be fun for a class project, scout project, holiday gifts, even a baby shower. Really terrific, thank you! That is soooo cool! I can't wait to try it with my son! Thats a fantastic idea!! Thanks for sharing..
Just stumbled across this and thought it was great. Very clever. I think I might have to try this with my little girl. Did these with our girl scouts tonight. Let me just say... AWESOME!!!! They were so easy, and turned out amazing!!!! Seriously, if I wasn't packing up to leave right now, I would be making candles ALL WEEKEND! LOVE it! Thanks so much for sharing this!!! I will try it for sure!!!!!!!!!!!! Thanks for the idea! I think I will try one for christmas. Thanks for sharing! BEST HOMEMADE GIFT EVER! I love how these look totally custom and expensive and yet they're so easy & cheap! Great idea!!! Cannot wait to try this! Mothers day presents, teacher gifts , thank yous...customized for your own decor! Love it and I will post what we end up doing! Thanks for the fun idea!!! Great idea! Question - how long does it take to melt the design to the candle? I'm trying to get some new ideas for Vacation Bible School crafts, but I only have so much time allotted for each craft. Just was curious; thanks! It doesn't take long at all. If you get one of the heat embossing guns (sold with scrapbooking supplies for about $20) it'll take just seconds. A hairdryer takes a little bit longer, but just a minute or so. Do you think this will work if you print the design on vellum instead of tissue paper? Yes it will, Robin. In fact, when I first used this technique to make my wedding favors, I stamped the designs on vellum. Do you have a link or post to how you made your wedding favours using this technique with rubber stamps, please? Heather, unfortunately I made those wedding favors way before I was blogging/taking photos. If I recall, I stamped a "LOVE" image on vellum, embossed it using embossing powder, then attached it using the same technique as on these candles. Thank you for this awesome idea! Today my kids and I made these for the Grandmas / Great Grandmas for Mother's Day. I took a recent photograph of the kiddos and printed it on tissue paper then placed it on one side of the candle. On the other side I put their names and "2012" - I had them hand write their names in marker on regular white paper, scanned them into the computer, then printed them onto tissue paper. SO much easier than trying to coach them not to write too hard on the tissue! To get the tissue through the printer I used masking tape to attach it to the bond paper. Went through easily, no muss, no fuss! You might be able to stamp right onto the candle, but I think it would be kind of tricky to find the right kind of ink to stick on the wax and get it around the curves of the candle. Found on Pinterest; making these today! Did you use water based markers or do I need permanent ones? Cindy, any kind of markers should work fine, they don't need to be permanent. You might just want to test them out on the tissue paper first ~ some brands/types of markers may bleed more than others on your tissue paper. Wonderful idea!! Would love to try this with my kids! 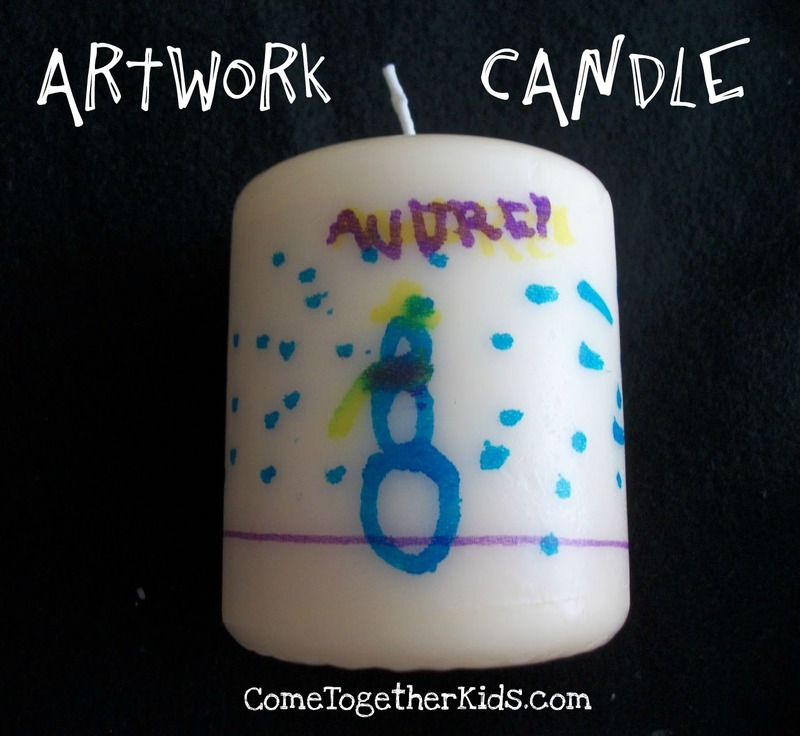 This is a great and easy craft to do, even with younger kids! I wouldn't burn it though, just keep it as decoration.... I burned one in my house and ended up with almost foot tall flames from just a votive!!!!!! Oh my goodness! We've burned several of ours (and the ones given as gifts) and never had higher than a normal flame. I wonder if the fact that it was a smaller candle had anything to do with it? Like perhaps the wick was closer to the melted tissue paper because it was smaller. Thanks for the word of warning! Hi there! I just came across this when I was looking for a craft for my 9 year old's b-day party. I have a question, is the tissue paper the one in the bathroom or the one you use to wrap gifts? Hi, it's the tissue paper you use to wrap gifts! Can you re-use the wax paper if you are making more than one candle or do you need a new piece of wax paper for each candle? You should be able to use it a couple times. Just keep an eye on it. I think the waxiness helps to hold the paper in place without sticking itself. My kids and I made these today and they turned out wonderful! Thank you so much for sharing such an easy and original craft...I shared your link on my art studio's facebook page! I am trying to find a way to do something like this but instead of candles I am wanting to put the words/artwork onto ceramic tiles (4x4). Have you ever tried something similar? Do you think this would work? Thanks so much for any help you can give!! I was looking for a gift for my inlaws, and just don't have time to go out and buy things today. We are celebrating christmas tomorrow. i didn't have white tissue paper, so used red and green with glitter, it still looks great. I think these will be a hit. thanks so much. What kind of markers did you use on this particular one? Would Crayola Washable ones work? They should work, Alyssa, but test it on your tissue paper first. Some markers bleed more than others on different types of tissue paper. Hope this helps. this looks like an awesome craft! i can't wait to try it for our mother's day projects....what size candle did you use? I've used it on all different sized candles. I just had to cut the tissue paper to fit it. I think the ones on this project were maybe 3-4" candles that I'd picked up at IKEA or the Dollar Store. Tried with my Girl Scout troop tonight and it didn't work out. We used hairdryers that were 1900 watts and the paper never melted onto the candles. Very disappointed. Oh no, I'm so sorry they didn't work out for you. We've done them several times and never had any problems. I'm not sure what went wrong to help you troubleshoot. Did you hold the hairdryer pretty close to the candle? You want to try to concentrate the heat as much as you can. could you use an clothes iron, or would that get to hot? Tried it for a Mother's Day gift for my 3 yr old grandson to give his mommy. Easy, adorable, fun, inexpensive and one of a kind. 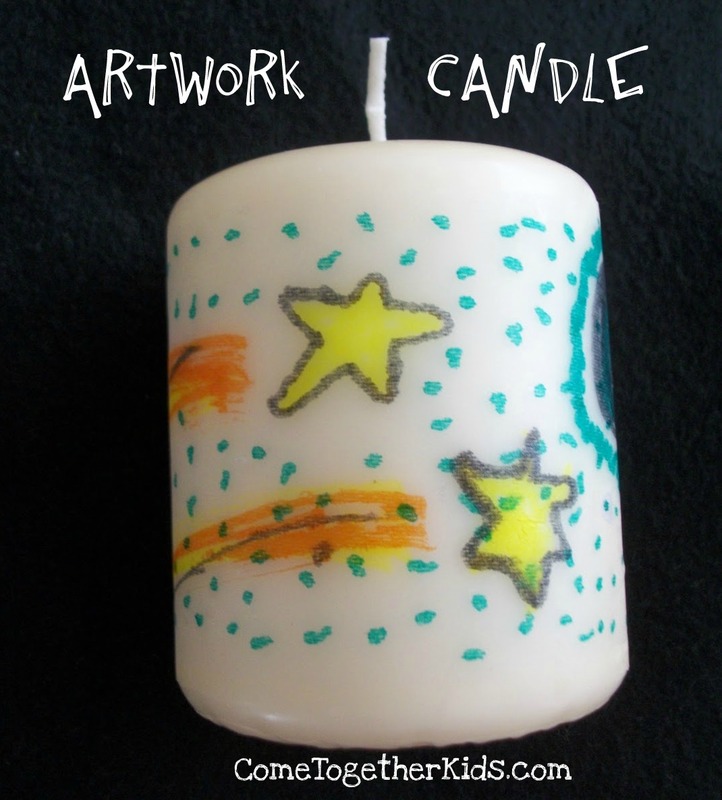 My 4 yr. old granddaughter and I just made the artwork candle for her mom's birthday. It turned out so cute and I think her mom will love it. 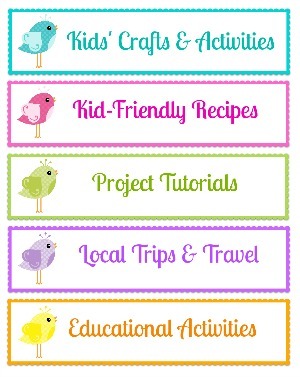 SUPER idea, great for all ages! good We'll have a deeper dive into the add-on below. SportsDevil Addon The brand evidently denotes everything you best. شركة المنزل هى شركة نقل عفش بالطائف لدينا العمالة المدربة على جميع خدمات نقل العفش بالطائف كما اننا لدينا السيارات المجهزة لنقل العفش ونستخدم اجود انواع الروافع التى تساعد على نقل العفش بالطائف وبأرخص الاسعار . good Your iPhone is flawlessly capable of taking magnificent http://bigphotographers.com with your apple iphone, please join customers nice. Great the remote working could be used, efficiently, https://imoappz.com do for you with your present smart devices Fine. خاصة وأن الحفاظ على المنزل نظيف ليس هو المسئولية الوحيدة التي لا تقع على عاتقك مع كل المسؤوليات الأخرى الخاصة بك، فيجب أن تكون قادر على التمتع بوقت فراغك ك على الممتلكات الخاصة بك والتي دائمًا ما تبحث عن أفضل طرق وأساليب التنظيف على مدار في العام. نحن نقدم طرق وآليات تنظيف مختلفة وفقا لاحتياجاتك، بما في ذلك كل أسبوع أو كل أسبوعين، كل ثلاثة أسابيع، كل أربعة أسابيع، شهريا، وعرض تنظيف لمرة واحدة حسب رغبتك عميلنا الكريم. Complete Information about Aadhar Card is available here. لا تقلقى بعد الان نحن شركة تنظيف منازل بالرياض كشركة متميزة فى أعمال التنظيف سوف نساعك فى الحصول على أفضل خدمات التنظيف البيوت والمنازل فى أقل وقت وبدون مجهود( شركة تنظيف سجاد بالرياض ) وبجودة فائقه لم تحصلى عليها من قبل وسوف تستعيدى جمال منزلك المبهر والمميز وتحولى منزلك مهما كان . وهو موقع ويب من شأنه يستطيع ان يسمح لمستخدميه برفع التسجيلات المرئية والصوتيه مجانا ومشاهدتها عبر البث الحي وعبره شبكات التواصل الاجتماعى ومشاركتها والتعليق عليها وغير ذلك من الاشياء الاخرى. حيث وانه كان قد تم تأسيسه في يوم 14 من شهر فبراير من عام 2005 ثلاث موظفين سابقين من شركة باي بال هم تشاد هيرلي وستيف تشين وجاود كريم، في مدينة سان برونو، سان ماتيو، كاليفورنيا، كما ويستخدم التطبيق تقنية أدوبي فلاش لكى يستطيع ان يعرض المقاطع المتحركة. وكذلك محتوى الموقع يتنوع بين مقاطع الأفلام، والتلفاز، والموسيقى، والفيديو المنتج من قبل المحبين للتسجيل والبث عبره اليوتيوب وغيرها. وهو حالياً مزود بـ 67 موظف. وفي شهر أكتوبر من عام 2006 أعلنت شركة Google العالميه التوصل لاتفاقية لشراء الموقع مقابل 1.65 مليار دولار أمريكي، أي ما يعادل 1.31 مليار يورو. حيث وان الموقع يعتبر من مواقع ويب 2.0.اختارت مجلة "تايم" الأمريكية موقع يوتيوب على الإنترنت كشخصية هامة وكان ذلك فى وقت سابق من عام 2006 وذلك لدورهِ في إعطاء الفراص لزوار اليوتيوب في إنتاج المواد التي يعرضونها في الموقع. الفيديو الذي رفعه "جاود" وكان هذا الفيديو بعنوان (أنا في حديقة الحيوان) حيث وكانت ترجمته بالإنجليزية: Me at the zoo ، وكان هذا الفيديو يوم 23 من شهر إبريل من عام 2005 م، وتبلغ فترته الزمنيه 18 ثانية فقط لاغير. كما ويعد موقع يوتيوب بحسب إلاحصائية الاخيره التى اجريت عن طريق موقع أليكسا ثالث من ضمن أكثر المواقع شعبية في العالم حالياً بعد موقعي فيس بوك و شركة جوجل العالميه . وفي شهر يوليو من عام 2006، حيث وان المسؤلين قد صرحوا بأن عدد مشاهدة الأفلام عبره موقع يوتيوب من قبل جميع الزوار كان قد وصل إلى 100 مليون يومياً. في شهر مارس من عام 2008، كانت قد قدرت تكلفة موقع يوتيوب بحوالي مليون دولار أمريكي يومياً . YouTube.com أصبح النطاق نشطاً في يوم 15 من شهر فبراير فى عام 2005، ومن بعد ذلك كان قد تم العمل على تصميم الموقع لعدة أشهر. كما وان موقع YouTube.com تم افتتحه ولاول مره كتجربة في شهر مايو من عام 2005، وافتتح رسمياً بعدها بستة أشهر.